Gaia's Calling is your guide to reconnecting with the Natural World. Join Alivia as she learns to release fear, open her heart and rediscover her natural state. Meet your Druid guide, journey into the realm of the faeries, receive wisdom from the trees, and ask the moon for advice. Includes: - 14 Meditations & Exercises - 33 Full Color Illustrations How this Book Works: The first section of this book is a fictional story about the main character's journey to rediscover her connection to the natural world. Intertwined within her journey are meditations and exercises that help her to rekindle her connection. At the end of this book, there is a section called "Meditations & Exercises." In that section, you will find detailed written instructions for each meditation and exercise. They are in order of appearance by chapter. I encourage you to set aside time each day, go outside and find a quiet spot where you can sit comfortably. Read a chapter and then perform the meditations or exercises that correspond to that chapter. Bring a journal with you to record your experiences, are they different than Alivia's? Invite a friend or two and read to each other, discuss the book, connect with each other and the earth. Use the time to be still and listen, what do you hear? Sat Nam and blessings to you on your journey fellow initiate -Alicia. 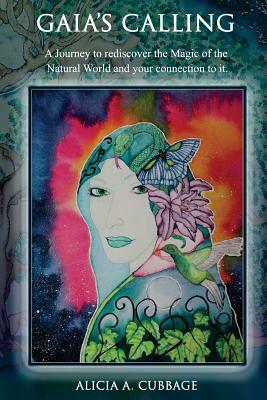 Alicia is a Mystic Visionary, Intuitive Artist and Author. She creates intuitively, drawing from the visions that come to her through her spiritual journey. Mystic: a person who seeks spiritual knowledge and unity with the Deity or the Absolute through contemplation and self-surrender. Visionary: A person who uses their creative and imaginative abilities to create solutions and see possibilities before they exist. Intuitive Artist & Author: A person who creates based on what they feel and know to be true even without conscious reasoning. Alicia started painting in June of 2014 after attending a watercolor workshop at a weekend retreat. When she returned home from the retreat, she purchased a set of beginner supplies and started painting. Beginning with only shapes and lines on paper, Alicia eventually taught herself how to draw and began creating many of the illustrations in this book. She has since designed, illustrated and published an affirmation deck called "Love Notes from the Universe" and an Oracle Deck called "Mystic Visions." Alicia is also an herbalist, practicing Kundalini yogi, Reiki Master, and Environmentalist.